Virtually everyone who has been fortunate enough to enjoy a holiday somewhere warm and beautiful has, at least fleetingly, harbored this fantasy: What if I said “To hell with it” and just stayed here? Found a little place to live, found a little shop to run . . . ? Usually, this fantasy runs aground upon two realities: (1) that the holiday paradise becomes less alluring when it’s your daily place of residence, with such unpleasantnesses to be dealt with as the off-season, work visas, and locals who liked you much better as a visitor than as a neighbor; and (2) that you are, ultimately, too tethered to too many things back home—family, job, the bagels at the shop down the street—to chuck everything and start life anew. But no such thinking deterred the two young American men who found themselves on the sunny Greek island of Santorini in the spring of 2002. They were undergraduates, for one thing—a pair of college juniors spending a year abroad at the University of Oxford, their futures uncharted. Furthermore, they were a high-minded breed of fantasist: their vision was not to spend their lives blotto and sun-blistered, wastin’ away in some tzatziki version of Margaritaville, but, rather, to open an independent bookstore. An independent bookstore! The most romantic of all shopkeeper fantasies, as represented in such movies as Nora Ephron’s You’ve Got Mail and, in real life, by the celebrated, becomingly ramshackle Paris bookstore Shakespeare and Company, whose charismatic, oddball American proprietor, George Whitman, had, from the 1950s until his death, in 2011, welcomed and employed generations of smart, questing young adults of bohemian disposition. As a matter of fact, one of the two young Americans had spent the previous summer living in Paris, getting caught up in the Shakespeare and Company scene. He had rented a garret on the Rue Dauphine and made his money teaching English; he was not a Tumbleweed, to use Whitman’s term for the youngsters of various nationalities who worked short stints for him in exchange for the privilege of bedding down in the store. But this young man, Craig Walzer, loved everything about Shakespeare and Company—its eccentricity, the sense of community it fostered, and the sparky intellect of its Tumbleweeds. Walzer and his American buddy from Oxford, Oliver Wise, ended up on Santorini more or less by chance. A family friend of Wise’s offered the boys an apartment in Athens to use for spring break, but after a few stifling days in the gritty Greek capital, they decided that they needed to get out to one of the islands. At the docks in Piraeus, they saw that the next boat leaving was bound for Santorini. They bought tickets. It was a fortuitous match of travelers and destination. Santorini, a crescent-shaped island in the southern Aegean, is a remnant of a gigantic volcanic eruption that took place around 1600 B.C., sinking the center of a larger island into the sea—a catastrophic event that some believe to have been Plato’s inspiration for the legend of Atlantis. Santorini’s villages are built into the steeply pitched hills that curve around the caldera, as the sea-filled crater is known. As a result, nearly every hotel, bar, and café on the island offers stunning, sweeping views of the azure Aegean, as well as the picturesque jumble of chalk-white buildings and blue-domed churches that cling precariously to the hills. Views and serenity were all that Walzer and Wise were after. They were not central-casting horndog American spring-break bros; they were philosophy majors. They had met at Oxford’s Pembroke College, where both were spending the school year in the service of the degrees they were pursuing back in the States—at Brown University for Walzer, and at Tufts for Wise. In the village of Imerovigli, they found a cheap bed-and-breakfast that came with a small terrace, perfect for lolling about and reading books. They were all set. The only trouble: about halfway through their one-week stay, they exhausted the reading material they’d brought with them—a bit of Nabokov, a bit of Rushdie, some Brautigan. An outing to Fira, the capital of Santorini, yielded no hope for replenishment—just some Stephen King paperbacks in a tourist kiosk. Those wouldn’t do. “Oliver, that’s a terrible name,” Walzer said. But by this point they were excited, feeding off of their mutual enthusiasm, trading ideas: We’ll get all our friends to come. We’ll take turns running it. We’ll do it for, like, 20-something years and then have our kids take over. Then Walzer and Wise got back to their B&B and fell asleep. Here is where the story might very well have ended, and, in most narratives of this nature, does end: with the collegians, in the sober light of day, laughing at the grandiose gabbing of the previous night. And yet. Atlantis Books is one of the most enchanting places a traveler could ever hope to stumble upon. 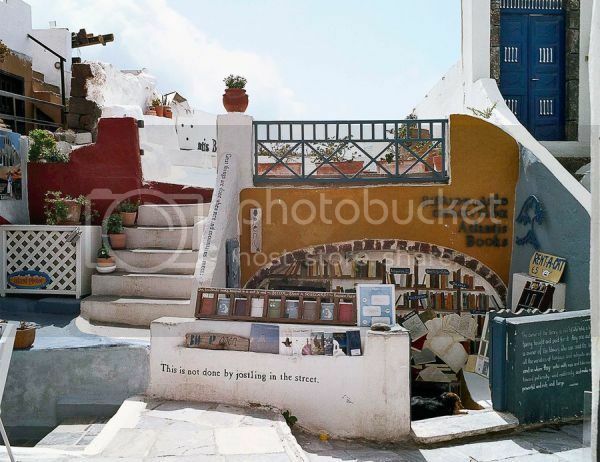 Take a walk along the central pathway that cuts through Oia, Santorini’s northernmost village (pronounced Ee-uh), and you’ll spot, opposite the old town hall, a low wall painted with a decorative mural of books haphazardly arranged upon shelves. The mural leads the eye to a descending, precipitously steep staircase. Eight steps down, you’ll find a two-room hobbit cave stuffed floor to ceiling with real books—mostly in English, but also in Greek, French, Italian, German, Spanish, and Chinese. The selection is exquisitely curated, and the books are displayed on tables and shelves for maximal aesthetic effect, the ones with pretty covers and striking spines taking pride of place. Most of the inventory is paperback, but, for the connoisseur, there is an array of hardback first editions of English-language classics, among them Hemingway’s The Old Man and the Sea and Steinbeck’s The Grapes of Wrath. Look more closely and you’ll notice that tucked within the shop’s white walls are the nooks and loft beds where the staff sleep—one of the beds perched right above the fiction section in the front room, hidden behind two hinged bookshelves. Above the shop, up a short flight of exterior stairs, is a terrace that looks out onto the Aegean. A sea captain’s house once stood where the terrace is, but it was leveled by an earthquake in 1956. Atlantis Books occupies what had been the captain’s basement. The terrace is a pleasant staging area for the store’s special events, such as the Caldera Arts & Literature Festival, whose headliners last year were the humorist David Sedaris and the former U.S. poet laureate Billy Collins. To state what by now should be obvious: Walzer and Wise’s cockamamie plan worked out. It took until 2004, and it ended up requiring four more founding partners besides themselves. But, yes, a bunch of English-speaking naïfs in their early 20s somehow succeeded in opening their dream bookstore. And over that span, Atlantis Books became an institution—both locally, because there is nothing else like it in Oia, and internationally, because word got out among bright, adventurous kids around the world that there was this vest-pocket version of Shakespeare and Company that you could go to and work at, and on a glorious resort island, no less. When I paid a visit to Santorini earlier this year, I was struck by how welcoming and knowledgeable its young employees are, and how worldly. The three I met, two men and one woman, were from Sweden, Belgium, and New York City, respectively. Helping them gear up for the busy season, which runs from May through October, was none other than Craig Walzer, in whose eye this lovely vision first gleamed. Walzer is 35 years old now, and his hairline is flecked with gray. The photos of him from the time of the bookstore’s founding depict a young man who, with his woolly beard, slight stature, and wire-rimmed glasses, looks like a skinny version of Richard Dreyfuss’s marine-biologist character in Jaws. Today the beard is trimmer and the frame a little thicker, but Walzer still has the inexhaustible energy of a recent postgraduate, working 16-hour days, and a tolerance for living rough that most of his contemporaries have long since aged out of. Working at Atlantis Books entails sharing very tight quarters. Everyone repeat-wears his or her clothes and is a little whiffy. Walzer is a persuasive, congenial fellow, at once a gifted raconteur and a dead-earnest idealist. From a young age, he told me, he was intent on making a difference in the world, “doing something that, capital H, helped others”—ideally becoming, someday, an attorney specializing in immigrant-and-refugee law. But as he finished out his college days at Brown, he couldn’t stop thinking about Santorini. And our chances really was a million to one. For Walzer, a doctor’s son, to even pursue the bookstore idea was a subversion of the bourgeois, Benjamin Braddock future laid out before him. As his graduation from Brown approached, he had already been accepted into a four-year program at Harvard in which he would attend both its prestigious law school and its John F. Kennedy School of Government. Instead, he chose to defer enrollment for a year and recruited four other partners besides Wise to launch Atlantis Books. The first was his oldest childhood friend, Chris Bloomfield, who had known Walzer since their toddler days in Memphis, where their parents had bonded over being outlier Jewish couples in Tennessee. Working a variety of jobs the summer after graduation, Walzer and Bloomfield (yet another philosophy-degree holder, via Indiana University) socked away $40,000 in seed money for their Greek adventure. The sixth member to enlist was Maria Papagapiou, a friend of Vincent-Smith’s then girlfriend and a fellow Cambridge alum. Born in Cyprus but raised in England, Papagapiou was hungry for a literary adventure and undaunted by being the sole woman involved. That she was fluent in Greek didn’t hurt. IT WAS EXTRAORDINARY HOW MAGNETIC THE STORE PROVED TO BE TO YOUNG WAYFARERS. On December 29, 2003, Walzer and the European contingent convened in Cambridge, where Vincent-Smith had rustled up an old, dark-blue Ford Transit van as the group’s means of conveyance from England to Santorini. With several boxes of books in tow, they embarked on their journey southeast by road and ferry. (Bloomfield and Wise would join them on Santorini a few weeks later.) The bedraggled van posse finally pulled into Oia on January 4, 2004—Walzer’s 23rd birthday, as it happened—only to find the village’s hotels and nearly all its restaurants boarded up for the off-season. An Oian fisherman took pity upon the youths and directed them to the one taverna that happened to be open. Soon thereafter, they located the spot where they would both live and launch the first version of their store, a rugged space on a promontory just below a crumbling Venetian castle. Papagapiou was flabbergasted by how little forethought Walzer had put into the logistics of setting up a bookstore. While she enjoyed serving as “a kind of mother figure, and having the responsibility not just of translating for the guys, but also translating culturally,” she also bore the burden of being the orderly, accountable one, all too cognizant of the daunting legal and bureaucratic challenges the group faced. “The guys had the language barrier to protect them from the urgencies of timelines and bits of paper that we needed to have in place,” she said. For example, Walzer and Wise, en route home from their spring break two years earlier, had paid a visit to the U.S. Embassy in Athens to determine the feasibility of two Americans’ opening a bookstore on Santorini. They accepted at face value the words of a cheerful Greek woman there who told them it would be easy, mainly a matter of getting a lease, procuring a cash register from an official tax office, and stocking a room with books: Voilà!—a bookstore! Now that they were back in Greece, though, they learned that they needed to acquire Greek residency permits, for which they would need to present their work visas . . . which none of the Americans had even thought to apply for, and which could be applied for only back in the United States. Disaster was averted when Vincent-Smith, a European Union passport holder, agreed to be, for legal purposes, the store’s sole proprietor that first year. The others, meanwhile, were bemused by Vincent-Smith’s flights of conceptual fancy. He was the project’s de facto architect and site foreman, but he viewed the store more as an “art project” than a business. In Vincent-Smith’s mind, he conflated the catastrophic magmatic event that created Santorini with lingering Y2K-era fear of imminent apocalypse, and therefore concentrated on producing a spiraling shelf design that, in theory, when viewed from above, suggested both a tsunami wave (a terrifying evocation of the past) and a snail’s shell (a safe space). His colleagues, for their part, just wanted to get the damned shelves up. No two individuals within the group clashed more pronouncedly than Papagapiou and Bloomfield. Easygoing and dude-ular, Bloomfield was a picture of guileless American optimism: a tousle-haired Phish follower in mesh Indiana University basketball shorts, prone to offering strangers high-fives. He found Papagapiou prickly and uptight, while she—pretty and pulled-together where the others were matted and feral, her long, dark hair tied back—found him goofy and useless. At one point, Papagapiou took Walzer aside, and, noting that everyone besides Bloomfield had a sort of prescribed role in the project, asked, “What is he even doing here?”—a meet-uncute scenario that Preston Sturges could not have drawn up any better. But once the store was up and running that spring, the tension gave way to shared excitement. It was extraordinary, really, how magnetic the store proved to be to college-age wayfarers. It started with two 20-year-old women from Munich who showed up—“in sarongs,” Walzer recalled—and sought permission to bed down for the night on the store’s terrace; they ended up staying several weeks, and one of them, Lisa Basten, later returned to help run the store. “There was a night when we were having dinner, a bunch of us gathered around this gorgeous old table that could seat 20 people comfortably, with the stars shining off the Aegean—and basically none of us knew who the others at the table were,” said Wise. “It felt like there was a momentum there that was bigger than any of us, like the store was taking on a life of its own.” Before long, Wise found himself swept up in that momentum. As Atlantis’s first summer turned to fall, he fell for a young woman who had walked through the store’s doors, an American Shakespeare and Company alum named Ryan Galvin. Soon thereafter, Wise was en route back to the United States, the Atlantis chapter of his life behind him. He and Galvin got engaged in 2006 and were married the following year. The locals were by and large supportive of the Atlantis kids—generous with advice, goodwill, and donations of building materials. (A small minority cast a wary eye, suspecting, given the sheer volume of young people flowing through, that the store was a front for a brothel.) But Atlantis Books was barely getting by. The original location was off the beaten path, and Walzer was dipping into his Harvard student-loan money to keep the operation afloat. The days were fairly quiet, and, even near dusk, when tourists stampeded in their direction to view the sunset from the Venetian castle next door, few stuck around to buy books. Still, as the end of the tourist season drew near, the Atlantis gang was pleased with what it had accomplished. The group’s members decided to give the store another go in 2005 in a new location—a spot smack dab in the middle of Oia that, because it was strictly and peculiarly a subterranean space, had no other takers. Mercer was unabashedly biased; he was a friend of the bookstore, acquainted with Walzer and Vincent-Smith since their Paris days. But the Guardian piece amplified interest in Atlantis Books, capturing the attention of travel journalists and ratifying the store’s status as something more than a flimsy experiment undertaken by a bunch of callow twerps. In its new location, Atlantis Books matured into something more like its creators’ original vision: a place that they could run part-time and otherwise entrust to their young trainees, especially as they grew older and moved on with their lives. In the autumn of 2005, Walzer finally began his classes at Harvard. Vincent-Smith and Brady had relocated to Edinburgh, the former to pursue his art, the latter to study for a master’s degree in American literature. Papagapiou and Bloomfield both became schoolteachers, she in her native Cyprus, he in Oakland, California. At Harvard, Walzer thrived academically and made inroads toward his greater goal of capital-H helping people. In 2007, he met Dave Eggers, who was appearing at the university with Valentino Achak Deng, the Sudanese protagonist of Eggers’s book What Is the What, a chronicle of Deng’s harrowing refugee journey through his civil-war-torn country. Walzer had spent part of the previous summer working on refugees’ cases for an NGO in Sudan. Eggers invited him to return to Sudan that year under the auspices of McSweeney’s, Eggers’s book-publishing company, to produce an oral history of the Sudanese who had survived being displaced and enslaved. The result was a book called Out of Exile, with Walzer credited as its editor. 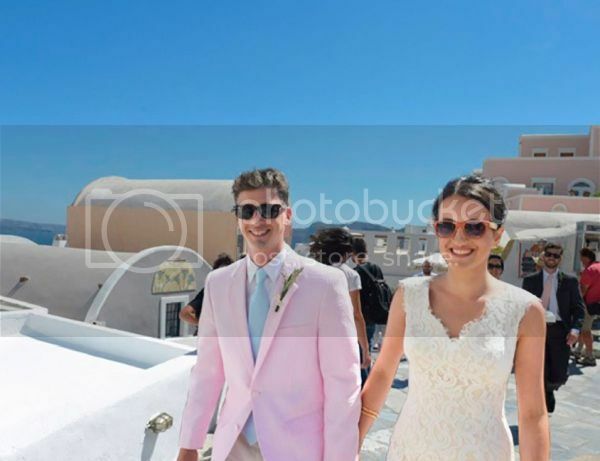 Bloomfield and Maria Papagapiou in Oia on their wedding day, 2014. In his conflicted state, and suddenly at loose ends, Walzer fell into a depression. For the better part of 2009 he avoided Atlantis Books, instead packing himself off to New Orleans, for no particular reason except that Oliver and Ryan Wise had recently moved there. (Oliver is currently a data-systems analyst for New Orleans mayor Mitch Landrieu.) A year later, having passed his hours playing chess, and discovering no higher truth, Walzer slunk out of New Orleans and decided to return, by default, to Santorini. En route, he stopped in Edinburgh and visited Will Brady. This was during a period of depression not only for Walzer but also for Atlantis Books. The churn of young, willing employees was as robust as ever, but the store had still not figured out a way to operate at a profit and, like a lot of Greek businesses in the midst of the nation’s debt crisis, was struggling to pay its suppliers on time. Together, Walzer and Brady hit upon the idea of publishing their own merchandise: specifically, essays and short stories in the public domain that could be printed in lightweight, postcard-size booklet form and sent off in airmail envelopes from Santorini to customers’ friends and loved ones back home. There soon followed a whole series of Paravion Press titles, among them Sherwood Anderson’s “Sophistication,” Saki’s “The Lumber-Room,” and Mark Twain’s “On the Decay of the Art of Lying.” To their surprise, the Atlantis staff discovered that they had an artisanal hit on their hands. Tourists loved the homemade aspect of the mini-books and took to buying them in bunches, as keepsakes as much as gifts. For Walzer, this humble little crafts project was a significant milestone: “the first thing that I had accomplished in solidly over a year,” he said. THE SHOP IS ONE OF THE MOST ENCHANTING PLACES A TRAVELER COULD HOPE TO FIND. Walzer’s re-engagement with the day-to-day running of the shop was well timed, because Bloomfield, who among the partners had borne the heaviest managerial burden during his childhood friend’s wilderness period, was about to experience a major life change. As he told Walzer in a phone call late in 2012 that knocked the latter out of his socks, he was engaged to be married. To Maria Papagapiou. Bloomfield and Papagapiou were married in a small civil ceremony in Oakland in October 2013. The following year, on the Fourth of July, they re-declared their vows in a Jewish ceremony on the terrace of Atlantis Books that doubled as a 10th-anniversary celebration of the store. By year’s end, there were more reasons to celebrate: Papagapiou was expecting a baby, and the store, for the first time in its history, had turned a small profit. All six of Atlantis Books’ founders are now in their mid- to late 30s. Walzer is the only one who remains unmarried, and the only one who still lives on Santorini. Of the other five, four met their future spouses through the shop; Vincent-Smith is the exception. In 2014, Walzer became the fifth of the original six to find love via Atlantis Books, falling for Elisa Bosco, a young Italian who came to work at the shop prior to beginning her doctoral studies at SUPAERO, a highly regarded aerospace engineering school in Toulouse, France. Walzer and Bosco plan to make a life together and have been splitting their time between Oia and Toulouse. The perpetually choppy waters through which Atlantis Books has navigated seemed to have entered a becalmed state by the spring of 2015. It was not to last. Walzer and Bosco were enjoying a pleasant May morning in Oia when one of the two brothers who own the building that Atlantis Books inhabits, Dimitris Theodoropoulos, showed up from Athens unannounced. Matter-of-factly, he told Walzer that, after many years of trying, he and his brother had obtained the construction permits they needed to build on top of the store’s terrace—a development that abruptly increased their property’s value. Walzer was welcome, Theodoropoulos said, to buy the property for a million euros, roughly 700 times his monthly rent. But he needed to get back to the landlords in two weeks. Otherwise, Atlantis Books would be required to pack up and get out by November. Walzer played it cool. He congratulated Theodoropoulos on the permits, promised to be in touch, and bade his landlord a safe trip back to Athens. Then he made a beeline for the bathroom and vomited. 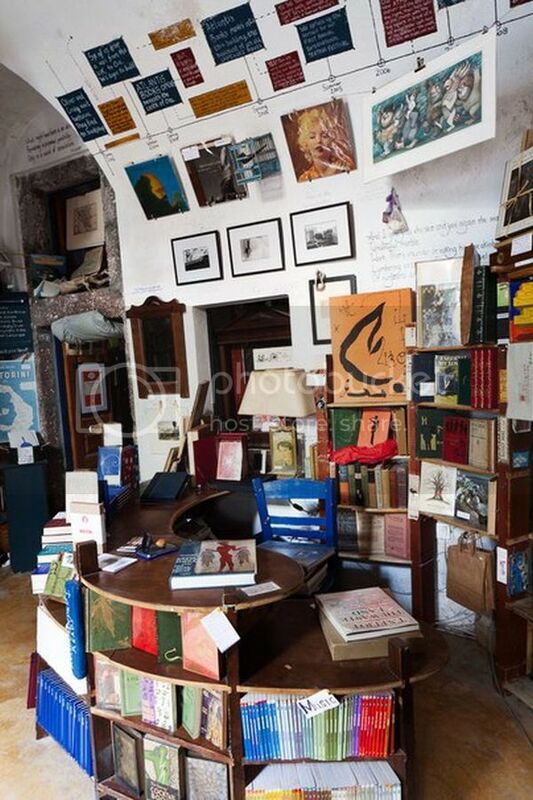 This being Greece, a nation whose layers of bureaucracy ensure that nothing gets done fast, the two-week deadline came and went; the bookstore remains open in the same space and, this past summer, enjoyed its most profitable season yet. Still, Atlantis Books finds itself at a crossroads. When I reached him on the phone, Theodoropoulos explained that, when he met with Walzer last year, he had received the necessary permits from the local Santorini government but is still awaiting the signature on a permit from the national government ministry that oversees the Aegean Islands. He expects to have this signed permit in hand soon. After that, he and his brother, Nontas, intend to sell the bookstore property as soon as possible. A day after he received his landlord’s ultimatum, Walzer’s head had cleared sufficiently for him to swing into action and consider his options. One, which remains on the table, is to go the crowd-funding route, which Atlantis did on a small scale five years ago, via Indiegogo, to carry itself through a financial pinch. Yet crowd-funding at the six- or seven-figure level carries many complications in terms of taxes and finance. Another option is to reopen Atlantis Books in a new location in Oia. There is precedent: Atlantis moved once before, after its first year. But that was a very different time. Though most of Greece has been mired in economic crisis since 2010, Santorini is another story. In the 90s and early aughts, it was still something of a budget getaway spot. But now the island is in the throes of a luxury boom, with new-build jewelry stores and clothing boutiques that sell Moncler coats and Jimmy Choo shoes. 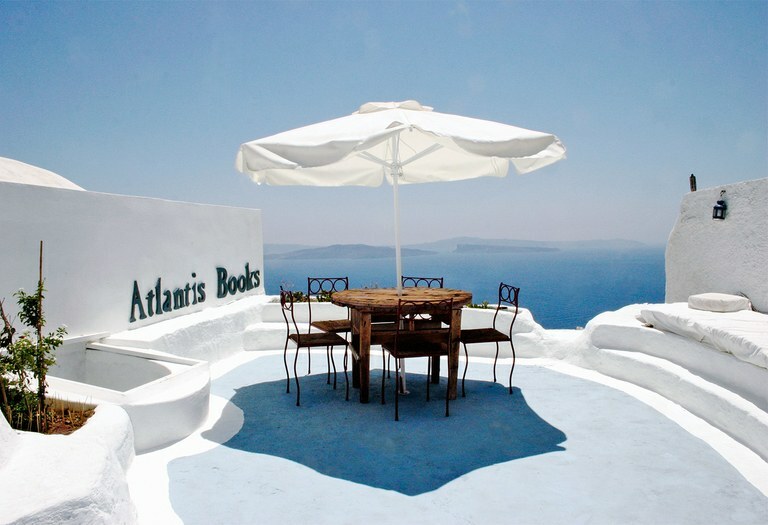 In this context, Atlantis Books, though it is only 12 years old, has evolved into an emblem of the laid-back, eccentric “old Santorini” that new money is upending. Which leads to the consideration of a third option: the principals of Atlantis Books declare that it’s been a hell of a run, but, indeed, times have changed, and now we’re going to call it a day. The entrance to the bookstore. On the other hand, he said, “I’m 35. I’m not a kid anymore. I’m also not the most employable character in the world. At this point, what I’ve learned is there is one thing that I know how to do better, humbly, than anybody else in the world right now, which is sell books on this street, in this village, on this island, in this country.” He can see making the bookshop work, no matter how the real-estate situation resolves, if he and Bosco could take a house in Finikia, the quiet village adjacent to Oia, and split their time between Santorini and wherever her engineering career takes her. It is in this regard that, perhaps, Walzer sells short the importance of what he has accomplished. One of the sweetest little details of Atlantis Books is a handwritten, outwardly expanding spiral of words on the domed ceiling directly above its till. Look closely and you’ll see that the spiral is composed of the first names of every person who has ever worked in the shop since it opened—young men and women of various ethnicities and nationalities, some now in their 40s, some still in their teens. Even if no further names are added beyond 2016, and the spiral stops growing, it already stands as a testament to Walzer’s “vortex” vision—and to the notion that, despite his doubts, he has already found a way to capital-H help people.